It’s no secret that I love my neighborhood, on the edge of Paris. Sure, I get to other areas: the Bastille in the 11th, the Marché d’Aligre in the 12th, and across town from time to time. But the Left Bank? Not so much. So when I cross the Seine, it’s got to be for a good reason. 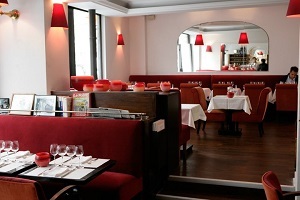 A great reason to go anywhere in Paris is for its restaurants. And one of my favorites is in the rue de Chevreuse in the 6th district, just a short hop from the most famous Parisian eateries in the Montparnasse-Vavin area, like Le Dôme and La Coupole. But when friends visiting Paris want to eat at those historic establishments, I always suggest the Caméléon d’Arabian instead. Why? Recently, at an apéro with my neighbors – our building only has 8 apartments – we were discussing what makes a really great restaurant. Is it the food? Sure, that’s important, but not the only thing. Or the atmosphere? Non. All of us agreed on one thing – and getting every neighbor in a Parisian building to agree on anything is pretty tough. We all concluded that a great restaurant has a sincere owner, the kind that not only greets you as you come in the door, but also takes the time to shake your hand, chat, and make jokes. Jean-Paul Arabian is just that kind of sincere restaurant owner. Born in the south of France to Greek-Armenian parentage, this grand gaillard, or strapping guy, greets all his customers as if they were his friends. And many are: the habitués who frequent his restaurant regularly come for business lunches, and make up part of the Parisian elite. Members of the venerable Académie française, well-known literary figures and journalists, and the heads of publishing houses all file in for a gourmet meal. Even before opening Le Caméléon, Arabian had plenty of experience rubbing shoulders with the glitterati of Paris. His mother, a seamstress, made custom suits for Charles de Gaulle, and his father was a bootmaker who counted Mistinguett among his clients. And the most formative experience for Arabian was when he worked in the very same restaurant where Mistinguett herself dined in the 1920s: Maxim’s. At Maxim’s, during the height of its fame with 3 Michelin stars, Arabian was a chef de rang, or head waiter. He served stars like Brigitte Bardot and Pierre Cardin, now the owner, along with Orson Welles, Ava Gardner, or the French actor Jean Gabin. Long before Arabian’s arrival, well-known people began flocking to the restaurant in the early 1900s, including an American tycoon named William B. Leeds, otherwise known as Billy B. So some people claim that the mussel soup served by the chef at Maxim’s was named for this man. But another story from the 1962 cookbook Chez Maxim’s: Secrets and Recipes from the World’s Most Famous Restaurant, by the Countess of Toulouse-Lautrec (yes, related to THAT Toulouse-Lautrec), relates the story of a client named William Brand in Normandy, before the recipe ever made it to Maxim’s. Chef Louis Barthe toiled behind the piano, or stoves, at a restaurant in Deauville that was known for a particularly delicious dish made with mussels. In France, we generally eat mussels with our fingers, picking out each meaty morsel with an empty shell that serves as a pair of tiny tongs. But William “Billy” Brand didn’t want his American buddies to have to work for their food. So Brand asked the chef to serve the mussel dish without the shells, and thus was born the soup that all Billy B.’s friends returned to the restaurant many times to eat. On the menu was written potage Billy B. 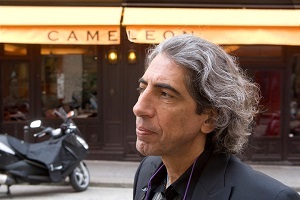 When Chef Louis Barthes left Deauville to work in Paris, guess where he ended up? You’re right: Maxim’s. And now Jean-Paul Arabian continues the tradition of Billy B. at Le Caméléon. The head chef at Le Caméléon says that since time immemorial, the restaurant has always used Paul Bocuse’s recipe for mussel soup with saffron. I guess we’ll never really know Chef Louis Barthe’s original recipe, but when this soup is so fine, who can complain? 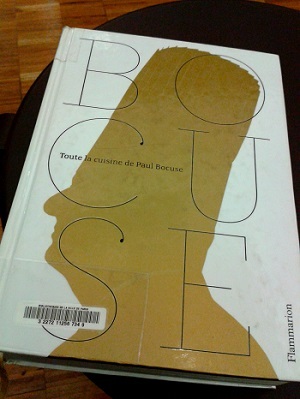 I’ve made a few (humble) changes to Bocuse’s recipe, to streamline it and to account for the fact that we no longer eat the same way as when Bocuse was creating recipes. Goodness, they ate a lot of butter! You might try your local fishmonger for fish fumet, but it’s not hard to make. I typically make the fumet the day before I make the soup, so the soup is faster to put together. You’ll find a good recipe here, which makes more than you’ll need, but you can freeze the rest for a rainy day! 1. Scrub the mussels and remove beards if necessary (see note above). In a medium saucepan with a tight-fitting lid, melt the butter over medium heat. When it foams, add the diced shallot and cook for about 3-4 minutes, just to soften it. 2. Pour in the wine, bring to the boil, and add the parsley stems. Then add the cleaned mussels. Cover immediately, and let them cook for about 4-5 minutes. 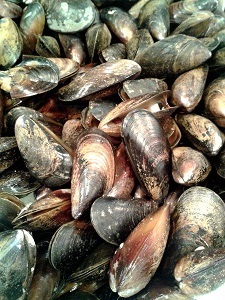 You can stir them up once or twice, and this will also allow you to see if the mussels are starting to open. 3. When all the mussels are open, remove the saucepan from the heat and let them cool, uncovered. 4. In another medium saucepan, heat the olive oil over medium heat and when it’s hot, add the sliced leeks and garlic. Lower the heat slightly and sauté for about 5 minutes. The leeks should look transparent but not colored. Add the fennel seeds if using, then stir and cook for 2 more minutes. 5. Add the fish fumet all at once and stir well. Using a slotted spoon, transfer the mussels to a bowl, throwing away any that didn’t open. Then strain the remaining liquid through a fine-meshed strainer, stopping just before you reach that gritty liquid at the bottom. 6. Pour the mussel-cooking liquid into the soup, and add the salt and pepper. 7. Bring to the boil, and let simmer for about 15 minutes, partially covered. In the meantime, remove the mussels from their shells, reserving some of the prettiest for the soup bowls as décor if you like. 8. Let the soup cool slightly, and purée using a wand mixer. Add the saffron and heavy cream, and return to low heat. Add the mussels, and warm the soup but don’t boil. Taste for seasoning. 9. Chop the parsley and serve with a healthy sprinkling of it, in small cups if it’s for a starter, and in wide, shallow soup bowls if this is your main course. Bon app’! The NY Times cookbook recipe for this lovely soup is also worth a try...has never failed me . Hi Peter: thanks for your message! I’ll definitely have to try that recipe from the NY Times cookbook. I’m always on the lookout for different versions of my favorite recipes. Bon appétit!